The main driver of growth in 3Q18 was fixed investment, which accelerated further and grew by more than 9% year-on-year (tab 1). As in the previous quarter, investment growth was relatively broad-based. Investment in infrastructure projects accelerated by 14.4% YoY, which is related to accelerating government investment at the end of the year. The rapid growth of investment in transport infrastructure and machinery and equipment also continued in 3Q. The second most significant driver of growth was household consumption, which maintained a year-on-year growth rate above 3%. Growth in household consumption is broad-based and apparent across both goods and services. As in the previous quarter, inventories and net exports proved to be drags on growth. 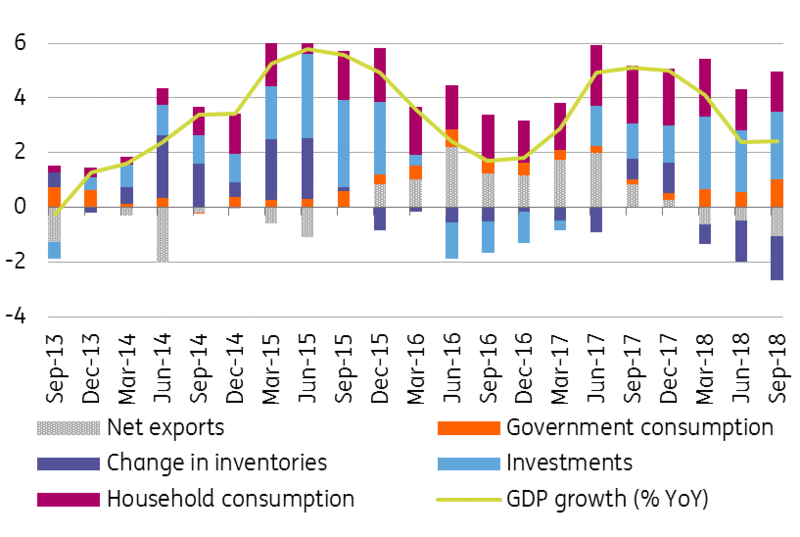 The year-on-year decline in inventories is related to the high base from the previous year, while the negative contribution of foreign trade is related to weaker foreign demand and higher imports (due to solid domestic demand and accelerating investment activity, which is import-intense). These two items are also the main reason behind the disappointing 3Q18 GDP growth figure. Though not a surprise, the manufacturing industry decelerated further to just 1% YoY after 2.5% in 2Q and more than 11% growth last year. This is the weakest YoY rate since the fourth quarter of 2013. It also confirms this year's trend that growth has shifted away from industry to services, with the previously-strong automotive segment stagnating this year. This trend will continue into next year in our view, although it's worth noting that the weakness in 3Q18 industrial figures might have been due to new emission standards, which started in September and hindered sales and production of many car models. This mainly affected car production in Germany, but it could also influence the Czech industrial supply chain. The breakdown of GDP growth confirms that the economy was driven by domestic demand, mainly due to strong investment activity and favourable household consumption, driven by wage growth. A change in inventories due to a high base and weaker exports proved to be a drag on growth. However, this can also be linked to the impact of new emission standards which have impacted car production, particularly in Germany, with possible knock-on effects to the domestic supply chain. In general, however, today's economic growth figures are more positive than the first estimate suggested. Quarterly economic growth reached 0.6%, which does not seem particularly worrying compared to the three-year average rate of 0.8% QoQ. For the whole of 2018, GDP growth will end slightly below 3% and a similar growth rate is expected for next year.